This month’s favourites are mainly makeup focused as my skincare hasn’t changed over to past couple of months. During the summer my makeup does change slightly as all I’m looking for is that staying power for my makeup to stay in place throughout the hot (sometimes sweaty!) days! When it gets to the summer, although most people lean towards using creamy makeup products to give them that dewy fresh look, I tend to reach for powders. During the summer I can get quite shiny and during the week at work, I want to ensure my makeup stays on as long as possible which is why I reach more for the powders face products. For an overall face powder, I have been recently loving the Rimmel Clear Complexion Clarifying Powder. This does not only stops me looking like a shiny mess throughout the day, it really affordable too. So much so that I’ve bought a couple of these compacts to keep in different handbags throughout the summer months. 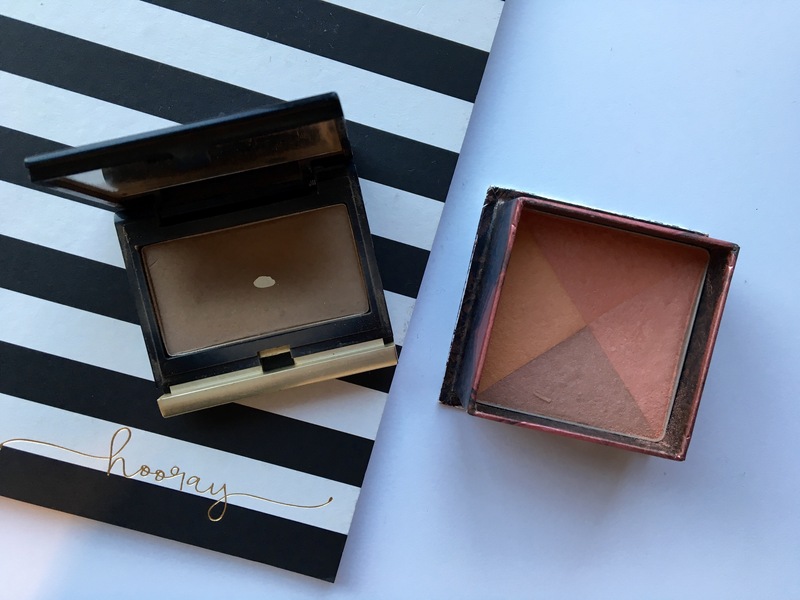 To add a bit of colour and dimension to my face I’ve been reaching for the Kevyn Aucoin Sculpting Powder for contouring and Benefit’s Box Blush in Sugarbomb for my cheeks. The Kevyn Aucoin Sculpting Powder has always been a firm favourite of mine and I find using a power contour instead of cream contour means the product doesn’t slip across my face throughout the day. The Sugarbomb blush by Benefit, as you can tell from the worn package is also a well-loved product of mine. 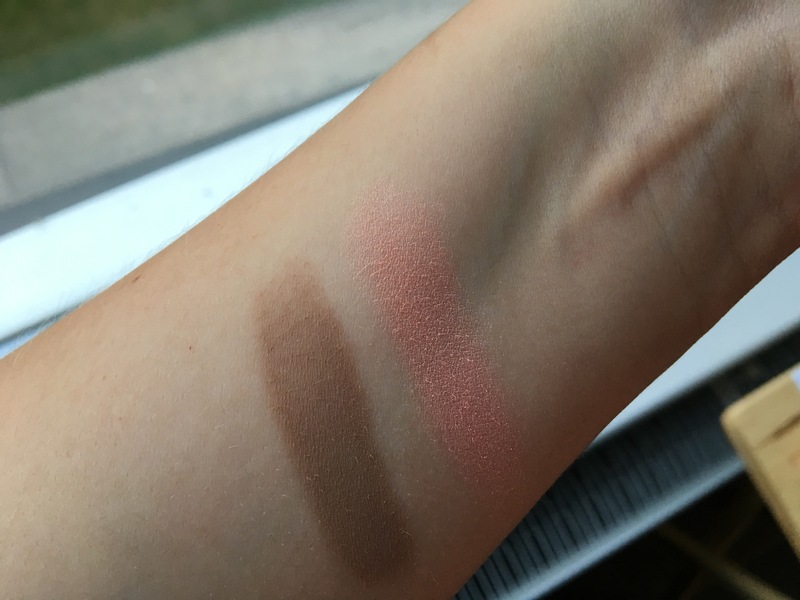 Although you see four different colours in the pan, they combine together to make a gorgeous pink toned blush which also adds a little bit of highlight to the top of your cheeks too. To keep everything in place over the warmer months I’ve also been using Revlon’s PhotoReady Perfecting Primer. I notice a real difference with my makeup when I’ve not used this primer underneath my makeup. When it comes to the end of hard working, hot and humid day, I find that my base needs very little touch-up if I’ve used this primer. Without using it, all my make-up have practically worn off by the time I’ve left work. And to add a pop of colour to my summer makeup routine, I’ve been loving the red nails, red lip combo. 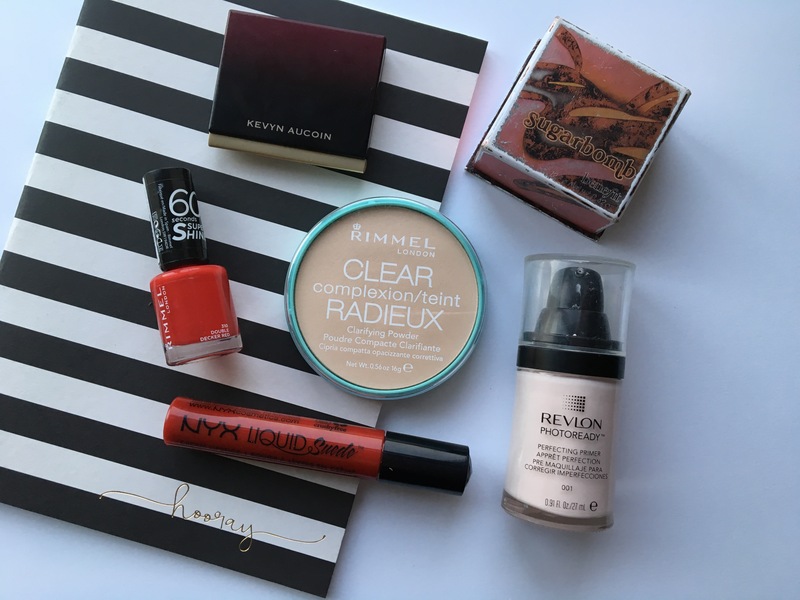 I love a dark coloured lip during the winter months, but when it comes to the summer I’ve never really been much of a coral/pink lip lover – instead I reach for the classic, bright reds! For my nails, I’ve been loving Rimmel’s Double Decker Red from their 60-second range. You get a great coat from this polish after just one application and it last pretty well on my nails too. For my lips, I’ve been reaching for NYX Liquid Suede Cream Lipstick in Kitten Heels. A gorgeous bright red and the formulation of these are great for longevity. What are your August favourites? Have you tried any of these products before? I’ll admit I’ve never been a big collector of perfumes, this is generally a collection I’ve built from gifts at Christmas and Birthdays. I tend not to buy perfume myself, because the ones I usually like are too expensive – I just can’t bring myself to spend £50 – £75 on myself just for perfume. I have however started to really enjoy more of the high-street perfumes (generally falling in the £10 to £20 range). Two of my favourite high-street perfumes are Body Shop’s Italian Summer Fig and Rosie For Autograph. These are great for wearing every day and not needing to worry about using up an expensive perfume for everyday use. The Body Shop make really nice perfumes and this Italian Summer Fig perfume is a gorgeous summer scent. The scent notes being, of course Fig but it also has notes of oak and amber which makes this perfume wearable but not too sweet. Rosie For Autograph perfume is one I’ve already talked about (see it here) so I won’t go into too much detail but this is a really nice everyday perfume to wear to work. The scent is floral and sweet with notes of vanilla but its toned down with the scent of sandalwood and musk – I really like this one! I do of course love a high-end perfume like every girl does. My current top favourites are; Viktor & Rolf Flowerbomb, Stella McCartney Original and Daisy By Marc Jacobs. Daisy by Marc Jacobs is more of a summer scent to me with scent notes such; Violet, Strawberry, Jasmine and White Wood so it makes it fresh and sweet. Stella McCartney, however is more of a warmer, floral scent with notes such as Amber, Mandarin Orange, Rose and Peony. This is actually an old bottle of Stella McCartney from her print collection range but I’ve still got a couple of uses left and saving them for a special occasion. It is one of my all-time favourite perfumes and one I’ll definitely being asking Santa for this year ;). Viktor & Rolf’s Flowerbomb is a close second favourite! A couple of years ago, this was ‘my scent’ as everyone used to recognise the scent and know I was nearby. It’s quite a strong perfume with notes of Bergamot, Jasmine, Orange Flower but I love it. I will always have a bottle of this in my collection! What is your favourite perfume? Do you have any recommendations? Real Techniques Miracle Complexion Sponge – I’ve recently spoken about the Real Techniques Miracle Complexion Sponge, so I won’t go into too much detail on how these sponges work but check out my ‘Battle of the Beauty Blenders’ to find out more. I’ve only been using beauty blenders for the past couple of years, and I now struggle to live without them – my favourite being the Real Technique’s sponge. They are great for either applying foundation or just bouncing over the skin to give you a more flawless look. I just find my foundation doesn’t quite sit right without using one. Cotton Buds – The most simple/cheapest tool in my makeup bag but I wouldn’t be without cotton buds! They come in useful for soooo many things; cleaning up mascara or eyeliner mistakes, soaked in nail polish remover can help neaten the edges of your manicure and even holding as a straight line to draw on your winged eyeliner or contour. The possibilities are endless…! MAC Eyelash Curlers – My lashes are so straight and stubborn, so I cannot live without my eyelash curlers. I’ve tried and tested a lot of different curlers in my time and my two favourite brands for eyelash curlers are MAC and Shu Uemura. Shu Uemura Eyelash Curlers are amazing but often a little harder to find, which is why I generally opt for the MAC eyelash curlers plus these are a little cheaper at £16 (Shu Uemura rrp. £20). I’ve had these for a couple of year now and they’re stilling going strong! MAC 217 – Any eyeshadow look is incomplete without using a fluffy brush like the MAC 217 to blend out the edges. Even if you’re a newbie to wearing eyeshadow, your look is instantly better as soon as you blend the edges of your eyeshadow as it makes the shadow look less harsh on the eye. Perfect for also blending different colours together as well on your lid. Its definitely a brush I couldn’t live without! Have you used any of these beauty tools before? What are your favourite beauty tools? This weekend I was in town early on Saturday morning and decided to take a look in Homesense. Turns out going in early in the morning, really pays off because I manage to bag myself some great bargains. I originally went to have a look at the stationary because I wanted to get myself a few new notes books and I ended up picking up a blue A5 notebook and a 3x pack of exercise style notebooks. There were quite a few different notebook packs available all from the brand Paperlove and these caught my eye because of all the gorgeous different styles and prints they came in. Restraining myself not to buy all of them, I opted for these beautiful monochrome with gold detail notebooks. I also wanted a more of journal style notebook, so I also picked up this lovely light blue, leather bound, snap popper fastened notebook. When I pick this up it didn’t have a price tag on it, but I presumed it would be around the £10 mark as this notebook felt very high quality. Instead, when I took it to the till to check the price they couldn’t find the proper price for it either so they put it through at the price of another A5 blue notebook – which wasn’t as nice, but I therefore brought at only £4.99! One tip when shopping in Homesense, if it hasn’t got a price take it to the till anyway – you might get yourself a bargain!! I then had a wonder around the beauty section. Generally when looking around the Homesense beauty section, you are faced with either a lot of strange brands which you’ve never heard of before or the decent beauty finds are always damaged. Going in early morning however, I managed to get first pick of what was on offer that day. When I arrived there was a girl still stacking the shelves with anything that was new in, and getting in her way (I feel kinda bad at! ), I had a good snoop around to see what was on offer! There were quite a few beauty finds I really wanted to pick up (brands like Elizabeth Arden, Nip & Fab, Burts Bees, St. Topez…) but as I’m trying to be good with my spending at the moment I just picked up two items – Jean Pierre Moisturizing Lip Masks and Indeed Laboratories Hydraluron Moisture Boosting Masks. 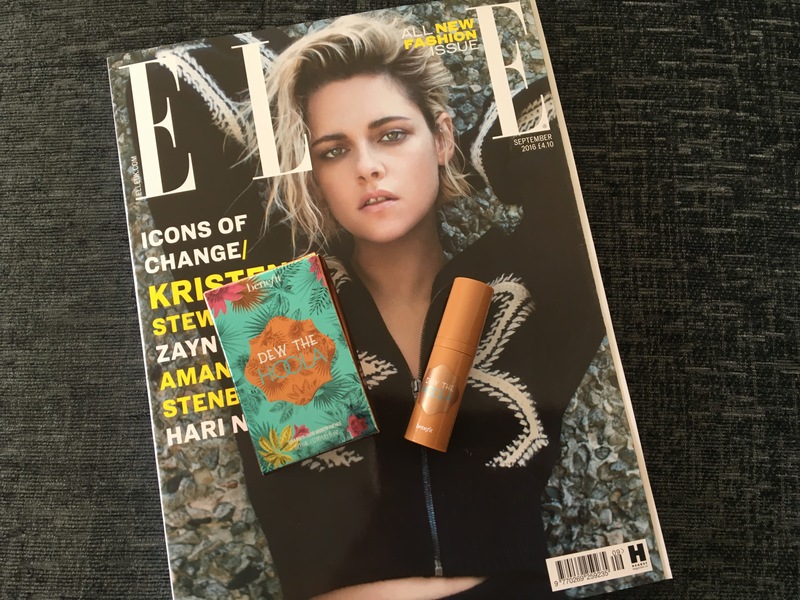 I picked up the lip masks as I’d recently read an article in Stylist Magazine about masks for your lips, and I was intrigued to find out what they were like. At only £2.99, I picked these up to try for myself. My biggest bargain however was the Indeed Laboratories Hydraluron Moisture Boosting Masks – retailing at £19.99, I picked these up for just £6.99! I think you’ll agree, a great find that I couldn’t leave behind! Making my way to the till, pleased with my Homesense finds, I then came across some Kate Spade phone cases by the till….! I love Kate Spade and all the cases on the stand looked so pretty. On closer inspection, I found that these beautiful phone cases which usually retail between £35 – £40, were only £12.99! Well, it was another bargain I just couldn’t turn away from, so picked myself up a gorgeous rose gold, chevron pattern iPhone 6 case too! I’m so pleased with my finds from Homesense, and I’ve definitely learnt that it’s better to go in early in the morning once the shelves are freshly stacked with new stock because that’s when you will find the best bargains!! Are you a fan of Homesense? Have you got any great finds recently? As you may know already, I’m a huge fan of a face clay face mask so when I heard that L’Oreal were bringing their own clay masks out, I got really excited! Even more excitingly, when these were released they were on offer for £5 each (rrp. £7.99) so I picked up two of them to try out! L’Oréal Pure Clay Purity Mask with the help of eucalyptus, aims to purify and mattify the skin. L’Oréal Pure Clay Detox Mask which contains charcoal to detoxify and clarify. L’Oréal Pure Clay Glow Mask including red algae to brighten and exfoliate. I decided to try the Detox and Glow mask based on my skin type (combination/mostly dry). I try to avoid most mattifing skin products as they tend to dry my skin out, but I do really like the fact that L’Oreal have decided bring out different masks to suit different skin types. The great idea about these masks though, is that you can use these all together as a multitasking mask treatment! For example – If you get an oily t-zone but the rest of your face looks dull and dry, you can apply the Detox mask just to your t-zone and use the Glow mask on the rest of your face to get the perfect balance all at once, rather than having to use different masks at throughout the week to gain your desired effect. Genius idea L’Oreal (both for skin care and marketing!) – Bravo! I’ve use these now each on their own all over my face and using the multitasking way, and I’m really enjoying them! The Detox mask is very much your traditional clay mask. When applied is dries on the skin, getting deep into all of your pores to give them a good clear out. I find this one really good when my skin is being troublesome because it really helps to clear my skin. The Glow mask is also good too but very different to anything I’ve used before. Its clay based also contains exfoliating beads (the type you find in the scrubby, gritty exfoliators). I’m not the biggest fan on the gritty exfoliator beads as I tend to use more chemical exfoliates but I have to say this does make my skin feel soft and glowy after using it. The only down-size I feel is the packaging. These face masks jars do look lovely and feel a lot more expensive that they actually are, but I’m waiting to knock one of these babies from my sink in my bathroom for it to smash and cover my floor in clay gloop. Just a word of warning if you’re a little clumsy, like meJ! All and all thought, I really like these clays masks and they are perfect if you are look for an affordable clay based face mask. Have you tried the L’Oreal Clay Masks yet? What did you think? Another Magazine Freebies Alert! ft. yet more Benefit! 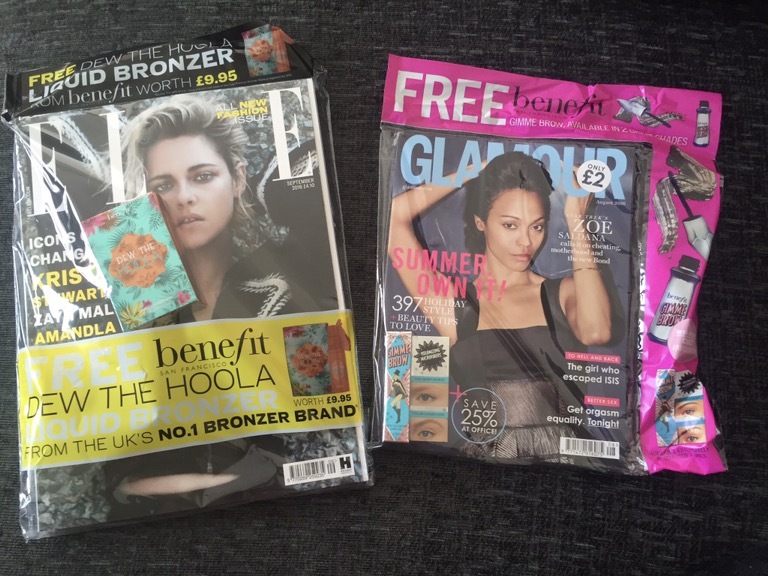 Another month, another stash of freebies with the glossy monthly magazines and Benefit are taking charge this summer! Once again Elle magazine has teamed up with Benefit giving away the new ‘Dew The Hoola’ liquid bronzer, worth £9.95. It’s a soft-matter liquid bronzer for the face which dispenses from a pump bottle. It’s a new concept which I’ve not actually before in the makeup aisle, so I’m really excited to give it a go. With the magazine only costing £4.10, it’s well worth picking up just to give this bronzer a test. One of the biggest makeup launches this summer has definitely been Benefit’s brow collection. Benefit have done a great job is getting samples out everywhere for us makeup junkies to get hooked I, ready for us to then want to buy the full sized products. Benefit have teamed up with a range of titles this summer and given away sample sizes of each of their new brow products. 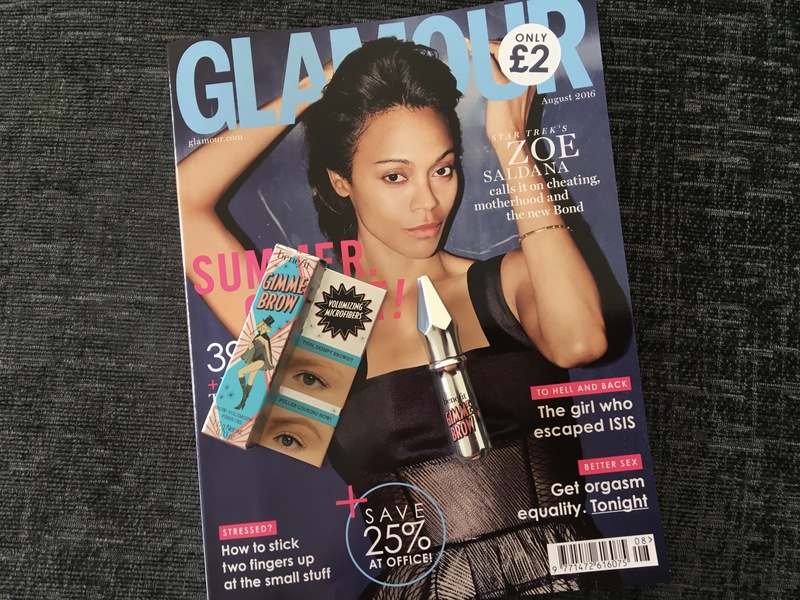 This month, Glamour are giving away a free sample of Benefit’s ‘Gimme Brow Fibre Gel’, so worth picking up Glamour magazine this month if you’ve fancied giving this a go! 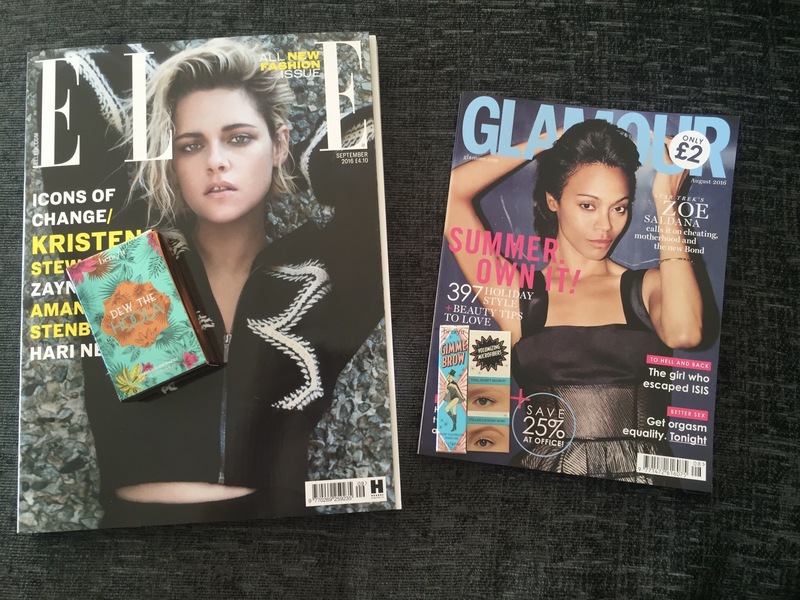 So run to nearest newsagent now and pick up your copy on Elle and Glamour to test these Benefits goodies! Have you seen any other good magazine freebies lately?? I did an empties post a couple of months ago (LINK here), so I thought I would share with you what else I’ve been using up lately. This month it’s a fairly small collection as I’m planning to do a make-up empties soon. Here’s a run through of my empties and I’ll be answering the question – will I be buying it again?! Have you used any of the above? What did you think and would you repurchase?